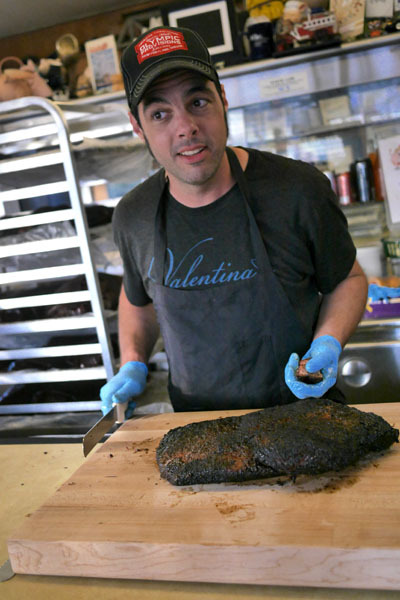 Back in March, it was reported that Aaron Franklin of Austin's Franklin Barbecue would be hitting the road for a series of pop-ups to promote his upcoming cookbook Franklin Barbecue: A Meat-Smoking Manifesto. 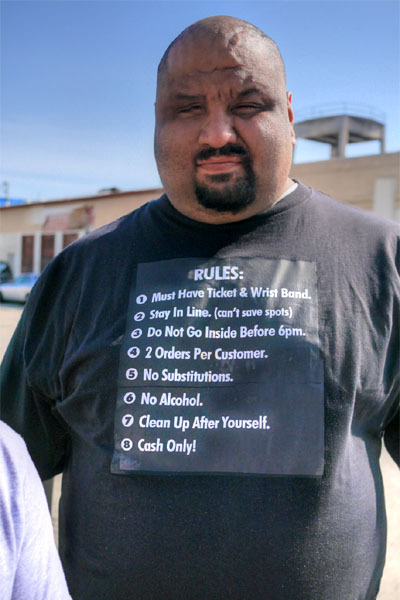 If that wasn't enough, joining him would be Adam Perry Lang, a fellow author and BBQ authority. However, such plans were soon nixed, only to be replaced by a more formal affair: a twosome of dinners to be held at Animal on April 13th and 14th. 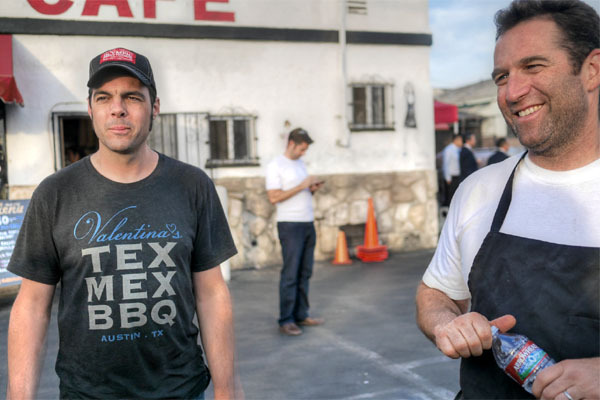 Designated El Jefe: Austin Midnight Dinner, the meals represent a collaborative effort with Roy Choi/Jon Favreau, and cubanos are indeed expected to be available outside. 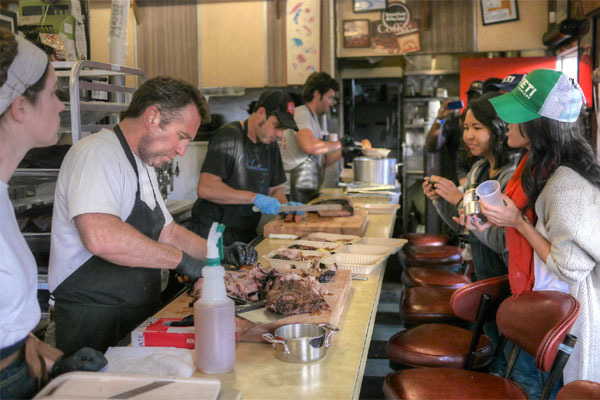 Reservations for this latest iteration of El Jefe sold out expectedly quickly, so in order to bring BBQ to the masses, Franklin and Perry Lang recently organized a more egalitarian, first-come-first-served gathering at Nick's Cafe in Chinatown. Though the event was advertised as starting at 6:00, I was somehow convinced to get there around 2:30. Turns out that was way overkill, as I think there were about five other people in line, all milling around the smoker. 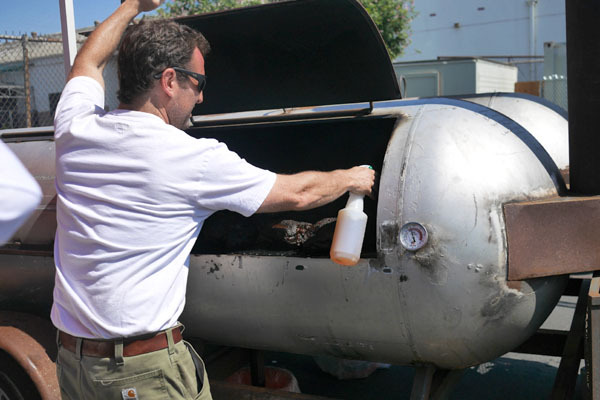 Every so often, Perry Lang would open up the contraption and spray the briskets (with a Worcestershire/water mixture I hear). Given the long wait, I brought along a few beers to help pass the time. 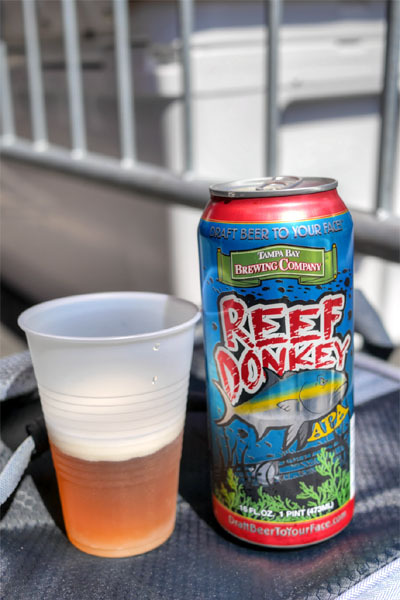 First up was a pale ale, the Tampa Bay Brewing Reef Donkey, which I found deliciously juicy, floral, and citrus-y on the nose. On the palate, it was sharper, more bitter, pinier--definitely a case of smelling better than it tastes. 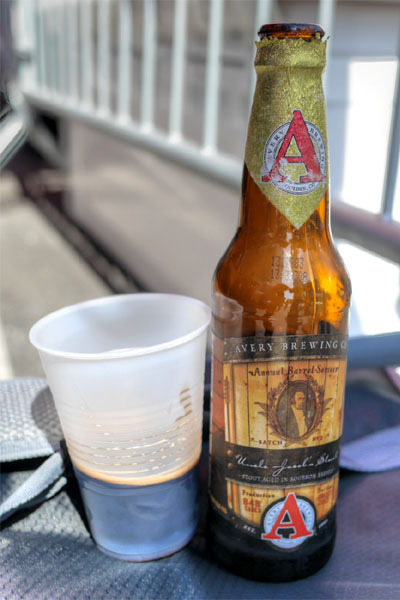 This was followed by the 2013 Avery Uncle Jacob's Stout, a six-month bourbon barrel-aged stout that I didn't particularly care for. I have a hard time describing it, but there was this odd astringency that just tasted off to me. Maybe this was a bad bottle, but it lacked the characteristics of most BBA stouts out there. 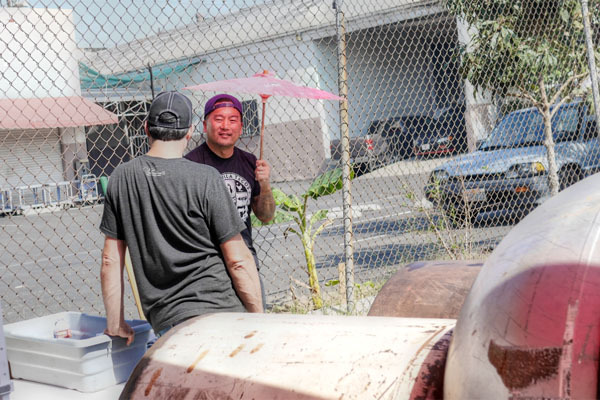 And look who shows up: none other than Roy Choi (with some Chego bowls for the team). Where did he even get the umbrella? 3:30, and still fewer than 10 people in line. 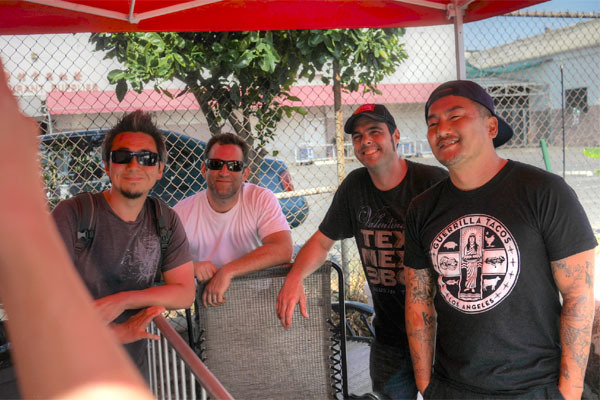 4:00, and we were instructed to form a line in order to secure wristbands and tickets. We were also presented with the $50 prix fix menu (cash only, limit two orders per person, inclusive of tax and tip) and the house rules at this time. Once ticketed and banded, we were able to sit down at picnic tables seemingly plucked from right out in front of Pok Pok Phat Thai. 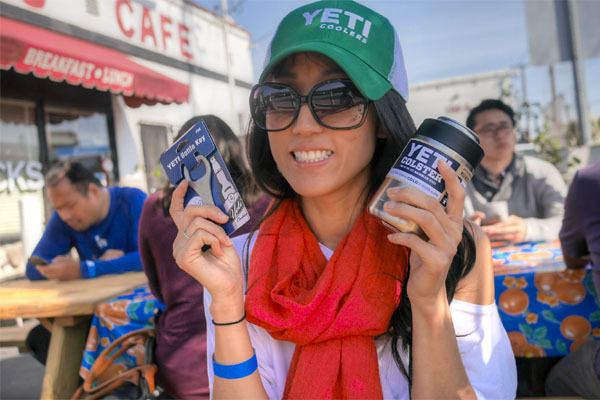 I'm assuming that the event was sponsored in part by Yeti Coolers (actually, Franklin is a brand ambassador), because reps from the company were on hand doling out swag (including extra goodies to Miss First-in-Line above). 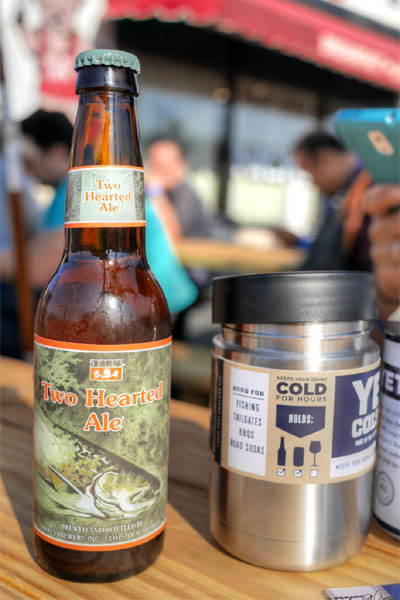 Time for more beer, this time the 2014 Bell's Two Hearted Ale. An IPA, this smelled heavily of juicy citrus and tasted of smooth malt and crisp hop bitterness. Quite good, though definitely better fresh. 6:00 came and went, and the two chefs soon came out to explain that more smoker time was needed. We were then instructed to line up once again, this time for the actual food. 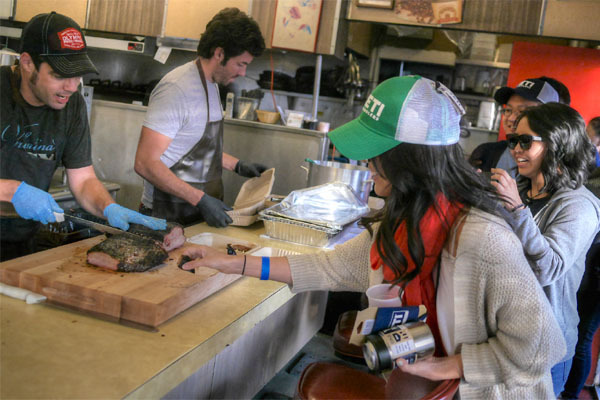 Franklin proceeded to carve out the first piece of brisket for the first person in line. 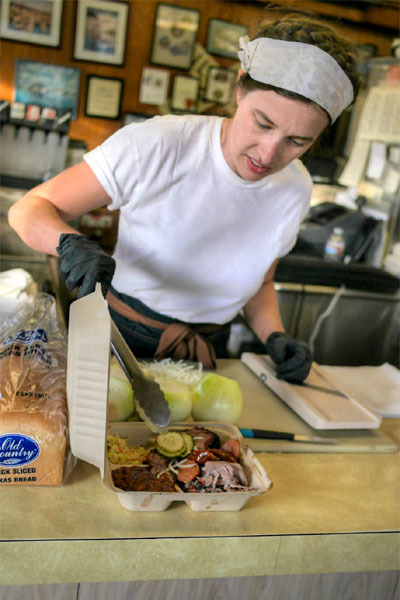 They had an assembly line going: first the sides, then the brisket, the sausage, the pork, and finishing up with the onions, pickles, and bread. 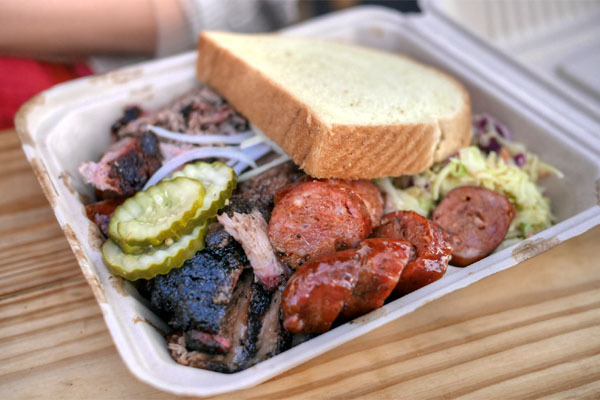 And here we see the finished product, a plate comprising Creekstone Farms prime brisket, Niman Ranch pork shoulder, linguiça sausage, beans, coleslaw, pickles, onions, and sliced bread. You gotta start with the Creekstone Farms prime brisket of course, easily some of the most flavorful I've had. I often yearn for more smoke on my brisket, but that wasn't a problem here, with its loads of smoke, char, and salt set against the inherent goodness of the beef. My only quibble? There were a few bites that veered overly dry. 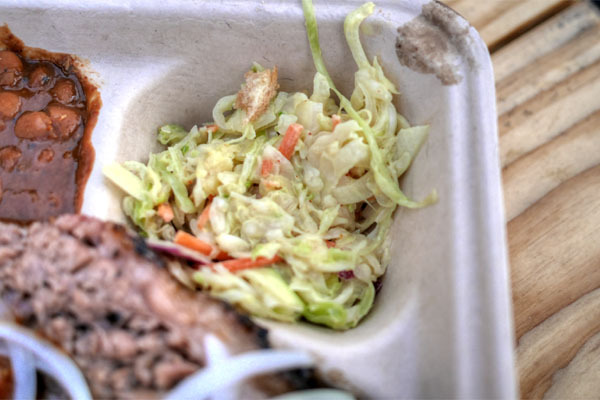 The coleslaw was a worthy example, a nice touch of levity to counteract all the meat in play. More beer. 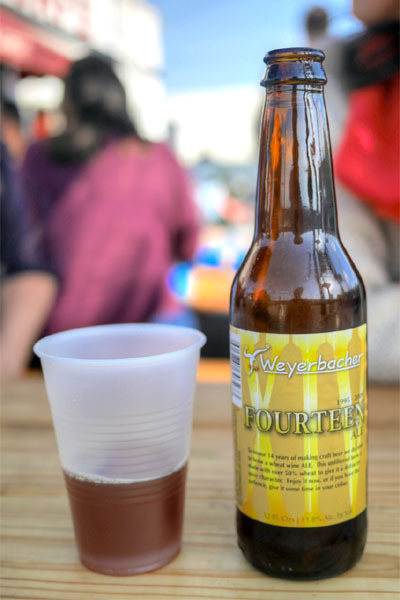 The 2009 Weyerbacher Fourteen was certainly the oldest of the bunch, made to celebrate the brewery's 14th anniversary. A wheat wine, I found this sweet, almost berry-like, with a nice malt profile to pair with the spicy and bitter notes present. 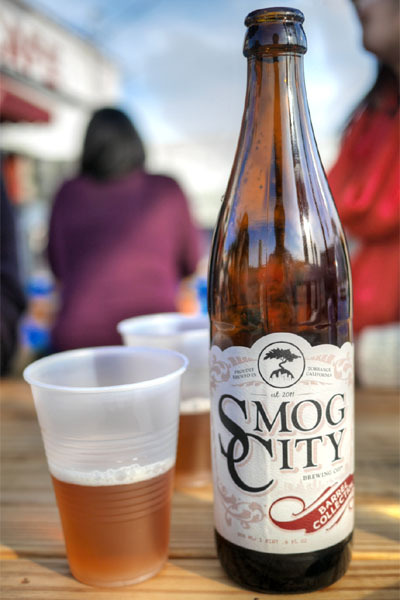 Following was the 2015 Smog City Goldie, a bourbon barrel-aged Belgian golden strong ale that was just released at the start of April. I wasn't a fan of this one, finding it far too sugary, far too candied, with a strong boozy component. Niman Ranch pork shoulder was pretty much spot on, coming out all juicy and tender, with a great char and porky savor to it all. 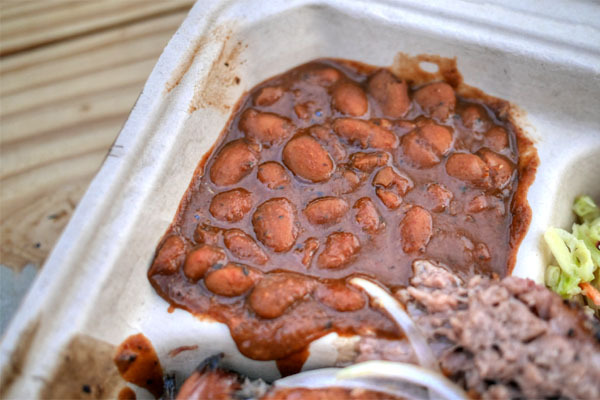 Beans had a bit of a spicy kick to 'em, which was a nice touch. Linguiça sausage was a winner, beautifully textured with a great snap to the casing and a palpable, but not domineering spice. 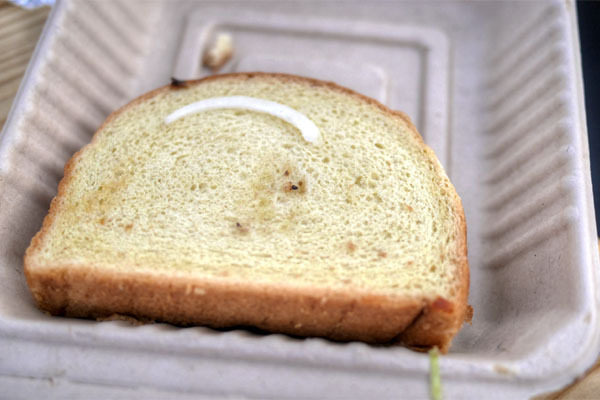 Sliced bread was of the Old Country variety, a thick, substantial cut that did a commendable job soaking up all the leftover liquid. 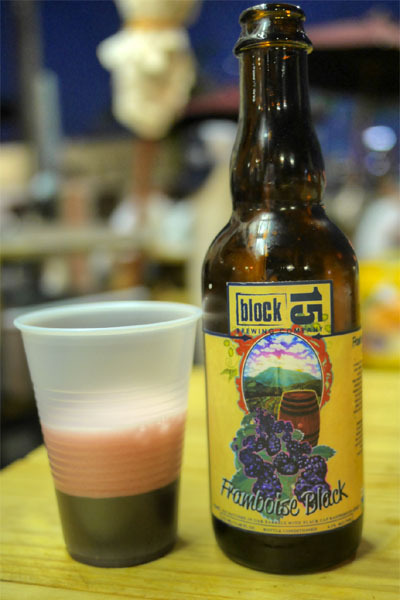 Last to imbibe was a brewery-only release from last November, the 2014 Block 15 Framboise Black, a blend of Belgian-style witbiers fermented with Brettanomyces and Lactobacillius and then aged a year in French oak with black cap raspberries. Jammy and wonderfully aromatic on the nose, it tasted of subdued fruit, with a dry, countervailing mustiness, spice, and tartness to even it all out. The two had quite a bit of meat left over at the end of the night, some of which I heard was donated to a local homeless shelter. 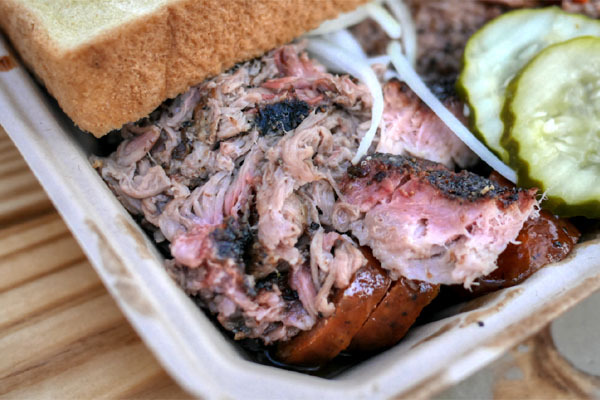 Fifty bucks for a styrofoam box of BBQ seems really excessive. Why the huge price? Because you're paying for the experience to be directly served by these two well known chefs. I would of gone had I known. 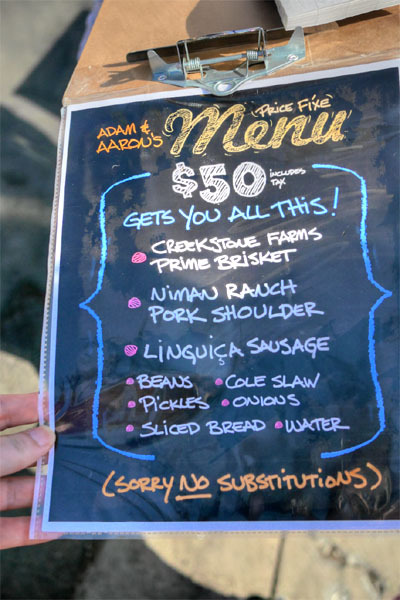 But for 50 bucks , Id hope that I'd be getting a pound of brisket , shoulder and a few rings of sausage and the usual sides. Yeah, some amazing chefs there. Stick a shoulder in a smoker for 16 hours. A moron could do it. What a scam. You have to figure, renting of the space and smoker in addition to the cost of shipping the meat and any temp staff. 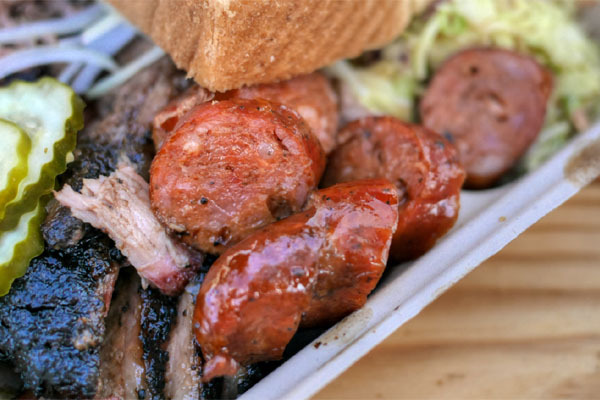 It's expensive for what it is but cheaper than a plane ticket to Austin and even a 3-4 hour wait is shorter than your average wait at Franklin's. Anonymous #3, you are a damn idiot. If you don't know about real bbq then you need to quit trolling and go eat at Lucille's or Chili's. 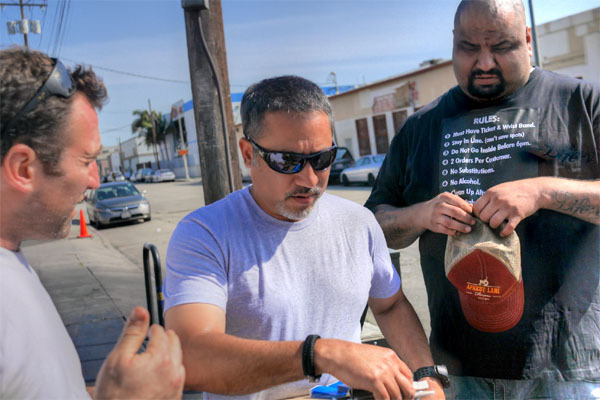 The real deal stuff from Franklin's own smokers is stuff that you have to put the time and work in to be able to even have a chance of learning. 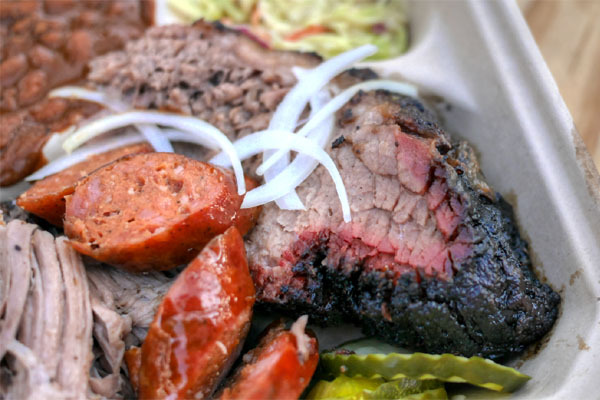 It's a mix of the right meat, the right rub and manning the temperature and knowing exactly how and when to handle the briskets. If a moron could do it, there would be much more "bbq" places out there. porky savor? your descriptions continue to impress. Surprised there weren't saccharine undertones on the cole slaw. Anon you're forgetting the "-----y goodness" of...pretty much every food item kevin describes? Must be nice to be able to afford all these expensive meals, write a sophomoric "review" and be considered an authority!